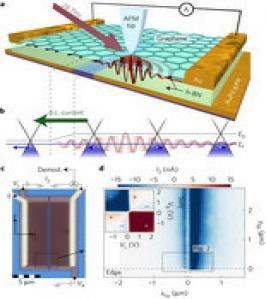 Researchers from the ICFO, in collaboration with CIC nanoGUNE, Columbia University and the National Institute for Materials Science in Japan, have been able to fabricate an all-graphene mid-infrared plasmon detector operating at room temperature, where a single graphene sheet serves simultaneously as the plasmonic generation medium and detector. The team used an experimental design with two local gates—a split metal sheet located underneath the graphene—to fully tune the thermoelectric and plasmonic behavior of the graphene. In contrast to the conventional back gating through a thick SiO2 layer, the separate local gates not only induce free carriers in the graphene to act as a plasmonic channel, but also create a thermoelectric detector for the plasmons. The resulting device converts the conveniently available natural decay product of the plasmon, electronic heat, directly into a voltage through the thermoelectric effect. The results of this paper may open a new pathway to graphene 'plasmo-electronics´, which would allow to perform mid-infrared opto-electronics at very small length scales. The team will further attempt to create a fully integrated system in which all three parts - source, channel, and receiver, are made of graphene, enabling a new ´all-carbon optics´ technology.